This meditation excerpt by Fr. Richard Rohr is one I very much relate to and should come back to, or remind myself of, on probably a daily basis. “All of us are much larger than the good or bad stories we tell about ourselves. Don’t get caught in “my” story, my hurts, my agenda. It’s too small. It’s not the whole you, not the Great You. It’s not the great river. It’s not where life is really going to happen. No wonder the Spirit is described as “flowing water” and as “a spring inside you” (John 4:10-14) or, as it states at the end of the Bible, as a “river of life” (Revelation 22:1-2). Your life is not really about “you.” It is part of a much larger stream called God. The separate self is finally an illusion for those who stay on the journey of prayer. I believe that faith might be precisely that ability to trust the river, to trust the flow and the Lover. It is a process that we don’t have to create, coerce, or improve. We simply need to allow it to flow. That takes immense confidence in God, especially when we’re hurting. Usually, I can feel myself get panicky. I want to make things right, and right now! I lose my ability to be present, and I go up into my head and start obsessing. I try to push or even create the river—the river that is already flowing through me. Faith does not need to push the river precisely because it is able to trust that there is a river. The river is flowing; we are in it. The river is God’s providential love—so do not be afraid. We have been given the Spirit (Luke 11:13). Without this awareness of the always flowing river, without a sense that we are supported, we will all succumb to fear and control mechanisms. Why wouldn’t we? To stay in God’s holding means that I have to stop taking full hold of myself, at least to some degree. I have to be able to hold a certain degree of uncertainty, ambiguity, and tension. Paradoxically, this leads to a much more calm and content way of “being in control”! 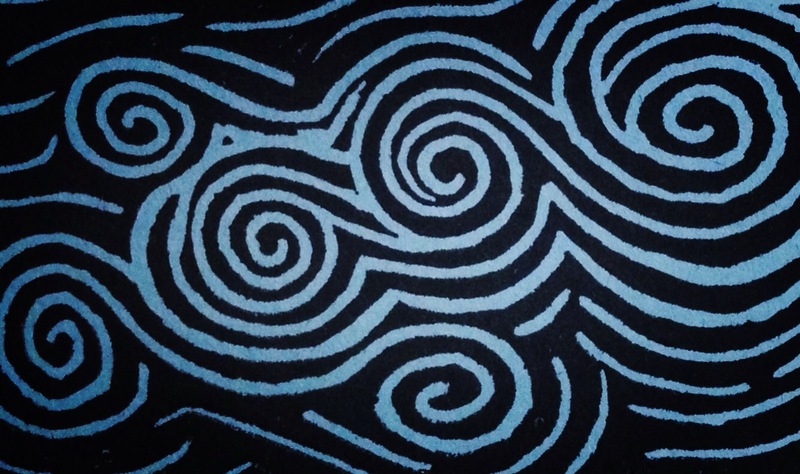 Linoleum print by Ora et Decora. 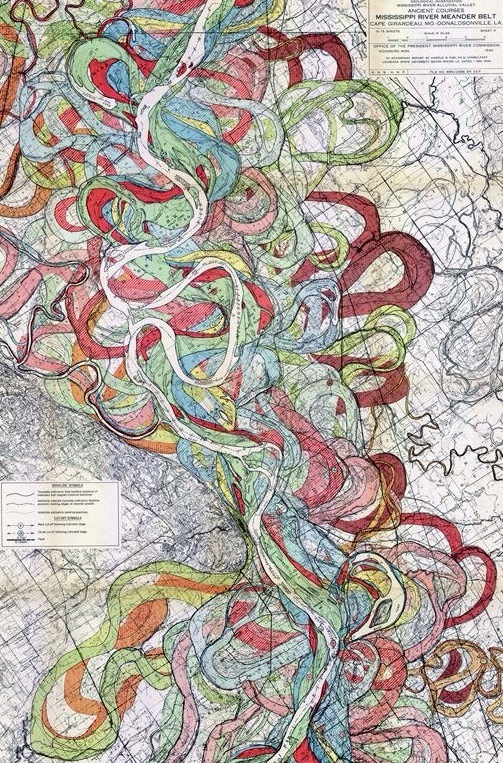 Map of the ancient meandering courses of the Mississippi River by Harold Fisk, 1944.